What are you conveying? How fast do you need to convey it? How often and where are you diverting it? Techniques, technology and implementations always follow need and application. Define your loads first, breaking them down by type (tote, carton, poly bags/envelops, loose items), shape, weight, balance and dimensions. Some products may not be suitable for some sortation methods. By defining your loads, you eliminate any unsuitable sortation method. 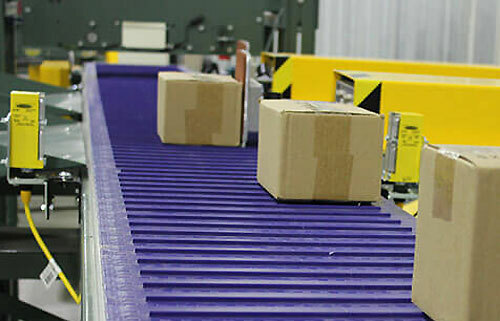 Sortation technology ranges from steady to very fast. What you’ll need depends on the speed of your conveyor line, the throughput of the system, the variety of destinations and the number of sorts required from the system. For many, product sortation needs low-volume sorters such as pushers, which are mounted on the side or overhead of a conveyor line. They push products off a line 90° during a sortation cycle onto another conveyor line, spur or into a chute. A right-angle pusher can achieve 45 cycles per minute. Overhead pushers also divert products 90 degrees. Both types can reposition products onto a parallel line. The Extenda pusher type can run fifty cartons per minute and offers space-saving functionality due to its design. Deflector arms, which use a swing arm or powered arm to divert conveyed loads, are another lower speed option. 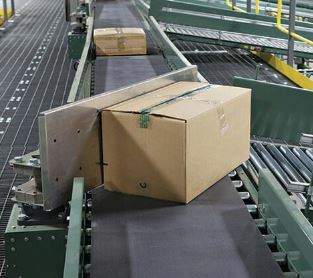 As a carton or tote enters the zone an arm swings to divert the product and send it to another angle in a sortation or accumulation application. Convergers, which are sometimes called mergers, move products from one conveyor to another. Pushers are faster than deflector arms but may cause product damage due to their speed. It’s best to understand the fragility of your load before choosing an option of this kind. Ball transfers are a gravity/manual transfer method that can be built into an effective conveyor system. When more speed is required than the slower options, there are a number of solutions. Pop-up sorters are an excellent method for sorting products. They are simple, effective and relatively fast transfer equipment that utilize wheels or rollers to “pop” up beneath a conveyed item, lift it, and move it toward its destination. Pop-up timing belt transfers are used for transfer to parallel conveyor lines. These are cost-efficient and effective transfers for zone picking applications. They were utilized for exactly this purpose by Educational Development Corporation. They gently lift and roll conveyed lines perpendicular to the conveyor and onto another line. For more information on these options (and many others) contact us today.